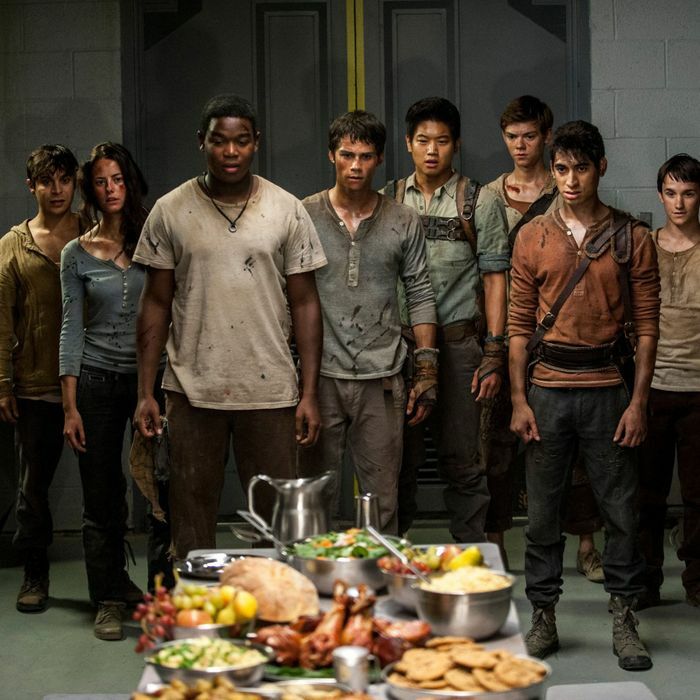 Last year’s The Maze Runner was a pleasant surprise — a young-adult adaptation that refused to overexplain itself, letting our uncertainty about its bewildering futuristic world mirror the characters’ own. In it, a group of amnesiac young men were trapped in an enclosed glade, with a mysterious and deadly maze as their sole means of escape — an intriguing dysbropia with an existential spin. But then The Maze Runner went and did something stupid: It let them escape from the maze. At the end of the film, our heroes stepped out into a fiery apocalypse, with futuristic soldiers and helicopters and whatnot all around the place. The stage was set for what would surely be a bunch of world-building, overinsistent sequels with little of the lean charm of the original. Now the first of those sequels is here, and for much of its first half, The Maze Runner: The Scorch Trials fulfills all of our worst fears about where this story would go (especially for those of us who haven’t read the original James Dashner YA novels). As the film starts, our protagonist from the first film, Thomas (Dylan O’Brien), and his companions Newt (Thomas Brodie-Sangster), Minho (Ki Hong Lee), Frypan (Dexter Darden), Winston (Alexander Flores), and Teresa (Kaya Scodelario, the lone girl in their crew), get a brief glimpse of the wasteland that the Earth has become. Blasted cityscapes? Check. Zombies? Check. Then they’re whisked away by WCKD (World Catastrophe Killzone Department), the mysterious organization responsible for putting them in the maze in the first place. (Militaristic, fascist plutocrats? Check.) They’re housed in a massive complex, where they join lots of other kids; there were apparently many different mazes. Occasionally, some of the kids are rounded up by WCKD and taken away — we’re not sure where to. (Human experimentation? Check.) Regardless, Thomas and his pals don’t want to wait to find out. They flee WCKD and head out into the Scorch, the aforementioned wasteland. It’s a deadly but thoroughly predictable postapocalyptic landscape: The rivers have become deserts. There are crazy lightning storms. (Environmental devastation? Check.) And more zombies. It’s an all-of-the-above sci-fi dystopia. There’s very little development to these characters, which is probably okay for those who remember the original film well, not so much for those of us who don’t. O’Brien, who gave Thomas a likable desperation in the first film, here goes a little too often to his signature move: running with his arms flailing and his mouth wide open. And so, The Scorch Trials starts to peter out under the weight of its meaninglessness and sheer unoriginality. Essentially, The Scorch Trials makes up for the humdrum YApocalypse of its first half by going a little bonkers in its second. We get underground, rat-eating, mutant root zombies. We get Barry Pepper with a Gatling gun. We get a demented rave that would make Saturday Night Live’s Stefon proud. (“This one’s got green aphrodisiacs, zombies on chains, and Alan Tudyk in velvet.”) As our heroes discover others out there in the Scorch, the story loosens up and starts to have fun, with admirable assists from a series of terrific character actors. So besides the aforementioned Tudyk and Pepper, Giancarlo Esposito shows up as a wasteland pirate, and Lili Taylor as a resistance leader. Character actors collecting paychecks in YA adaptations are nothing new; a friend once called the Harry Potter series “a retirement plan for the Royal Shakespeare Company.” But they’re especially welcome in this case, because they make up for the film’s thin script and the younger actors’ mostly anonymous performances by letting their own personas fill the void. Meanwhile, director Wes Ball brings the right level of energy, at least to the second half. Many of the action setpieces are derivative, to be sure, with echoes of everything from Transformers: Dark of the Moon to Terminator Genisys, but they’re effective nevertheless. And he seems to have grown as a choreographer of chaos since the first film, which was often incoherent when it came to chases and fights. Now he keeps things moving without forsaking clarity, which is all the more impressive given the far bigger scale of this production. The Scorch Trials isn’t a particularly good movie, but it’s just fast and nutty enough to keep you entertained.